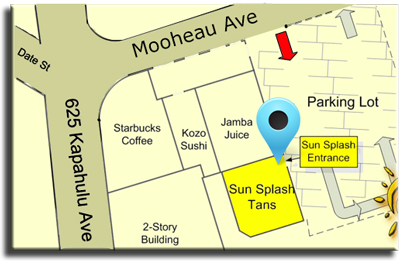 Sun Splash is located along side Jamba Juice with FREE parking in rear of the building, which is also where our entrance is. We are in the heart of Honolulu near Diamondhead so if you’re looking for a spray tan near Waikiki, red light therapy in Honolulu, or a great indoor tan anywhere on Oahu, come to Sun Splash Tans. Sun Splash is the ONLY salon in Hawaii to have 5 different levels of tanning beds, spray tanning, and red light therapy ensuring you will find something that fits your needs no matter where you are on Oahu. OPEN 7 DAYS A WEEK: 09:00 a.m. – 9:00 p.m.